The following article was originally published in the Fall 2002 issue of Wildlife Activist. For years, for some a lifetime, many have dreamed of a day when the Kittatinny Ridge opposite Palmerton, degraded by decades of industrial pollution from zinc smelting, would once again be covered in lush green vegetation. In 1984 the U.S. Environmental Protection Agency declared it so…and hopes soared. But the years dragged on. Today the dream is closer to becoming a reality than ever before. The Lehigh Gap Restoration Project (LGRP) will boldly accelerate the recovery of this land, working in partnership with Mother Nature, local communities, governments and corporations. The plan was conceptualized at the beginning of 2002. The Wildlife Information Center’s Board of Directors took a step back from its plan to acquire a parcel of land, perhaps a small farm, on which to build an education center and research facility. 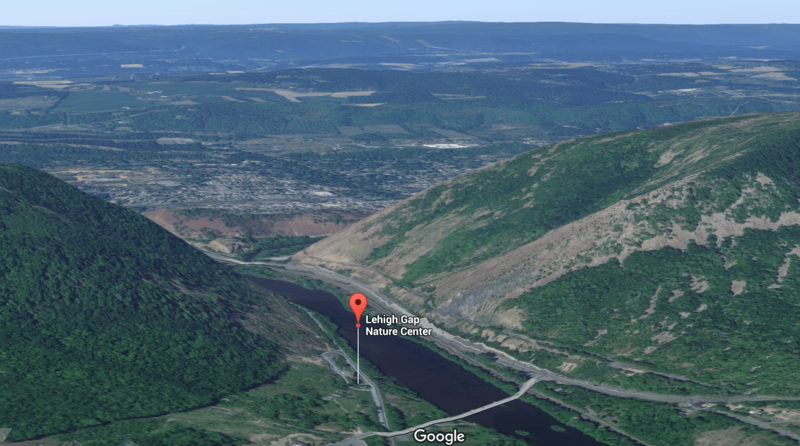 Why not focus our efforts on the Lehigh Gap? Why not create a legacy for future generations? Why not?? We had already been approached by a local land owner wanting to sell his 300 acres of land along the north side of the mountain just east of the Turnpike tunnel. Some research on adjacent parcels of land led to face to face discussions, which led to an almost chilling conclusion: A contiguous 800 acre tract of land on the north side of the Kittatinny Ridge, extending from the Lehigh Gap west to the Pennsylvania Turnpike tunnel and from the lower railroad bed adjacent to the Lehigh River up to the top of the mountain, could be secured by the Center and transformed into a nature preserve. But how to do it? The Center’s ten-year Land Fund had raised $100,000. A mighty sum for a small, member supported, non-profit, tax-exempt wildlife conservation organization…but only 5% of the funds needed to secure the land and endow a sustaining stewardship. The answer, like a beautiful rainbow, opened up before us in a meeting at the Center in February. Bill Mineo, the Stewardship and Trail Manager of the Delaware & Lehigh National Heritage Corridor and a veteran of similar projects, laid out the process for us. Simply, Bill said, for a project this grand, write a project plan and submit a grant proposal to the state Department of Conservation & Natural Resources. The DCNR will fund 50% of the project and foundations and corporations will fund the other 50%. The rest is history in the making and a dream coming true. The Wildlife Information Center has a vision for restoring this land and establishing a major regional ecotourism facility including hiking trails, interpretive facilities, and wildlife habitat. We envision working with nature, which is already reclaiming the land on its own, to accelerate the return of native, natural vegetation in the Gap. In addition, we plan to develop a nature and education center with recreational trails and lookouts, a facility housing interpretive displays and space for educational programs for the public. We will also invite local historical societies to become involved with the interpretive mission of the education facility as well. Finally, we will use the entire Lehigh Gap area as an outdoor classroom. Conditions on the most degraded part of the mountainside are severe. Little soil remains, and the barren mountainside is dry, windswept, suffering severe cold and extreme heat, and periodically subject to fire. While it is difficult to imagine that any plant could survive here, nature has developed plants that thrive in such conditions – warm season grasses. An interesting possibility exists for the establishment, on part of the land, of a grassland or savanna type ecosystem similar to that of the Serpentine Barrens in southeastern Pennsylvania, which has similar soil conditions. Other pioneers – grasses, gray birch, sassafras, green brier, and pitch pine to name a few – are already moving into the less contaminated areas and have begun the process of primary succession that will eventually lead to a restored ecosystem. The Appalachian Trail (AT) and Delaware & Lehigh (D&L) National Heritage Corridor Trail along the Lehigh River intersect at the Route 873 bridge over the Lehigh, just north of Slatington, PA. This confluence also marks LGNC’s headquarters site and the eastern most point of the 756 acre property. The foot traffic from the AT and D&L trails, plus the vehicle traffic on Routes 873 and 248 provide excellent visibility and ready visitor access. With an initial $100,000 in the bank and guidance from Bill Mineo to hold on to this money and make it part of the long-term endowment fund for the project, how will we come up with the big dollars needed to pay for this land? The approach is simple, buy now and pay later. There are three separate tracks of land in the project and we have signed agreements of sale for two, and the third will be signed shortly. The Wildlife Center will soon be the owner of 800 acres on the north slope of the Blue Mountain running from the Lehigh Gap to the PA Turnpike tunnel. But we still have a lot of work to do. Each of the three land deals is structured differently, with some payment up front and terms for the balance. Several bridge loans were needed to support these deals and were obtained from conservation organizations and several members of the Wildlife Center. A critical $200,000 loan from The Nature Conservancy of PA helped us secure one of the properties that would have been lost otherwise. The repayment of these loans will be made with grant money to be obtained from various sources (we hope!!) like the Pennsylvania Department of Conservation & Natural Resources’ Keystone Fund, environmentally focused philanthropic foundations, and major corporations. Finally, many of our current and former members are pledging their financial support for our capital campaign at whatever level they can. The response to date from our members and friends, while representing only a small portion of the funds needed, has been heart warming. We thank you and we will make you proud! Shortly after Labor Day, we mailed letters to all current members of the Center informing them about the Lehigh Gap Restoration Project and inviting them to make a contribution or pledge to our capital campaign. We felt it important to inform our membership first, prior to going public with the project. We struggled with the timing of this announcement as we were in negotiations for the land over the summer months. We knew that information about the project was seeping out via the growing list of players involved in the project. Finally, after informing our membership, Executive Director Dan Kunkle held a well attended news conference at the Center’s current office in Slatington on September 12. The following day the Allentown Morning Call published a great article about the project, complete with an eight-color map inset of the land area being acquired. The Call did a follow-up article three days later and other local papers also carried complimentary stories about the project. The LGRP was featured on local cable TV (TV13) three times and WVIA Wilkes-Barre Scranton Public Radio. Dan Kunkle also did a live on air interview with WDIY Public Radio in Bethlehem and is scheduled for several more upcoming interviews with other news outlets. This public visibility is gaining momentum for the project. Local citizens, politicians, businesses, and other conservation organizations are quick to grasp the many benefits garnered by restoring this land to its original beauty. They are lining up to partner with the Wildlife Center to provide assistance and support. There is no going back now…the Lehigh Gap Restoration Project is quickly becoming bigger than the sum of its many parts. There is still so much of this story yet to be written. Once we catch our collective breath from the land deals and financing struggles, we will turn our attention to the land itself. It will be a slow process, one measured in years, for sure. But the annual progress will be visible, the community involvement significant, and the public use and enjoyment of this wonderful natural resource will be secured forever. Dan Kunkle told us that in his academic studies, the destroyed landscape of the Lehigh Gap was included in textbooks documenting just how “bad” environmentally bad can get. He also told us that one day they will document just how good this environmentally bad landscape has become. That’s the dream, and today is the beginning of that dream coming true.